Adding to the 52 cookbooks list. 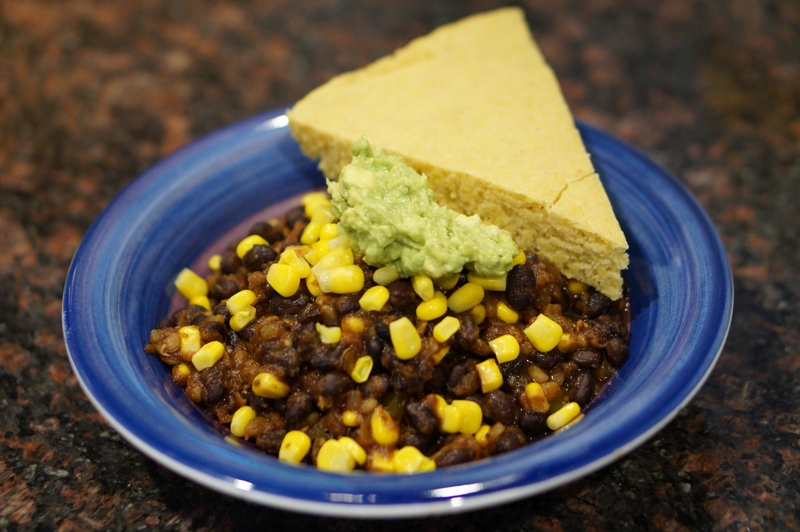 First up, cornbread from Peter Berley’s The Modern Vegetarian Kitchen. I posted my adapted version of his recipe already and often make this when we have chili for dinner. Next up, Energy Bites from Robin Robertson’s Quick Fix Vegan. This is the very last recipe in this book and it’s a good one. They’ve got cashews, sunflower seeds, dates, cranberries and peanut butter (which I substituted for the tahini). The kids ate them at first and then lost interest but I thought they were great right through to the last one! We make a lot of chili around here. It’s easy to throw together in the slow cooker and it’s something healthy that we know the big kid will eat. Books by Robin Robertson will make many appearances in our 52 cookbooks list and she always has great chili recipes. The Smoky Red Bean Chili with Chipotle-Cornbread Dumplings from Vegan on the Cheap was one we hadn’t tried before but it sure was delicious. And it was easier than making a batch of cornbread separately, though that’s always good too. Robin Robertson will show up frequently in our 52 cookbooks collection. This Coconut Spinach and Lentil Dal from Vegan Without Borders was a great lunch on a recent cold winter day. It was easily done with staples we usually have on hand – frozen spinach, coconut milk, canned tomatoes and lentils. Plus plenty of spices! We served it with diced and fried tofu. We have yet to make something from Vegan Without Borders that we didn’t like and this was no exception. We hope everyone had a great holiday season and we wish you well for 2016. Yesterday we continued our tradition of having black-eyed peas and greens on New Year’s Day. This year we had some friends over for New Year’s dinner so we made a lot of food. It was two years ago when we first made the Black-Eyed Pea and Collard tacos from Isa Does It, and again they were a great twist on our New Year’s Day tradition. We also made a variation of the Happy New Year Chili from Robin Robertson’s Fresh From the Vegan Slow Cooker. In addition to the black-eyed peas called for in the recipe we also added of collards and corn, so this chili was the embodiment of the phrase “peas for pennies, greens for dollars, and corn for gold”. One fun idea we have for 2016 is to make at least one recipe from a different cookbook every week all year. Since there will likely be times we don’t keep up with this goal we’re starting with two cookbooks here. Some weeks we may miss and other weeks we may do more than one but by the end of the year we hope to have posted about 52 cookbooks. 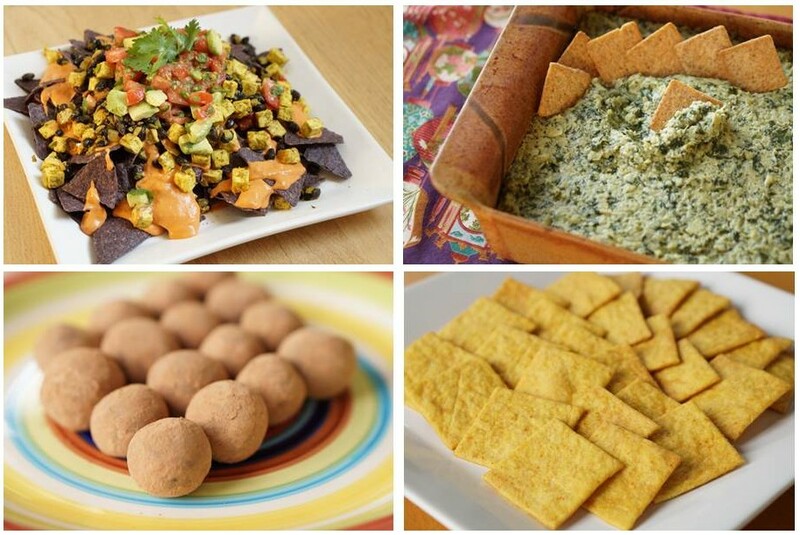 Check out the 52 cookbooks tag to see how we’re progressing! It’s been a while since we’ve posted but we’ve got a good excuse – we’ve been spending a lot of time testing recipes for Robin Robertson’s next cookbook. Meanwhile we just picked up a copy of her newest release, Cook the Pantry, and are looking forward to trying many of the quick and easy recipes there. Tonight we made Everyone’s Favorite Black Bean Chili and it was indeed a favorite. It was so quick to make I also took the time to make guacamole and corn bread. The recipe is here. We didn’t use soy curls but did add lentils. The addition of barbecue sauce gave it a subtle sweetness that was quite nice. Our 7-year-old loved it. First some fun news. We’re going to be testing recipes for Robin Robertson‘s next cookbook! There’s not much more we can say about it right now but we’re really looking forward to it. Helping Robin with her next book reminded me of a time long ago when we reviewed one of her previous books on our first blog. 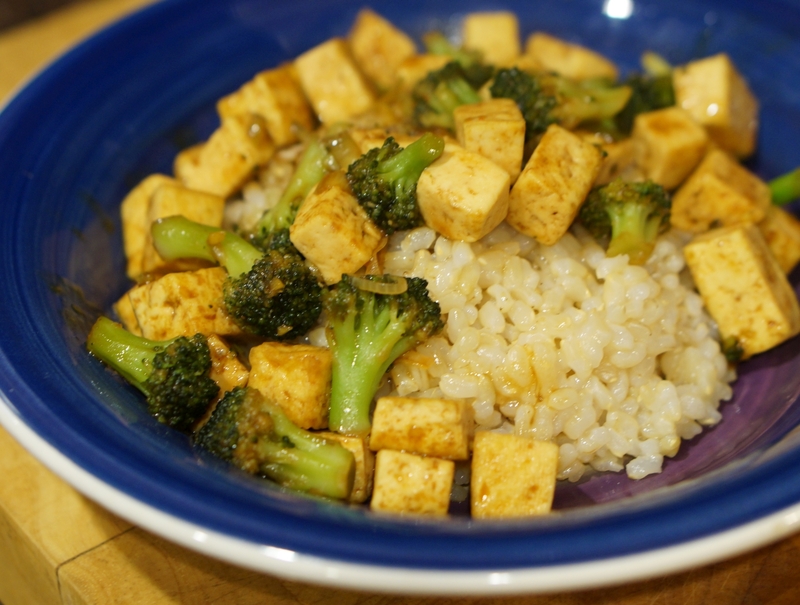 One of the recipes we wrote about was the Tofu and Broccoli with Hoisin-Ginger Sauce. Looking back at our Eat Air blog from that time brings back a lot of memories because that was when Darlene was pregnant with our first child. 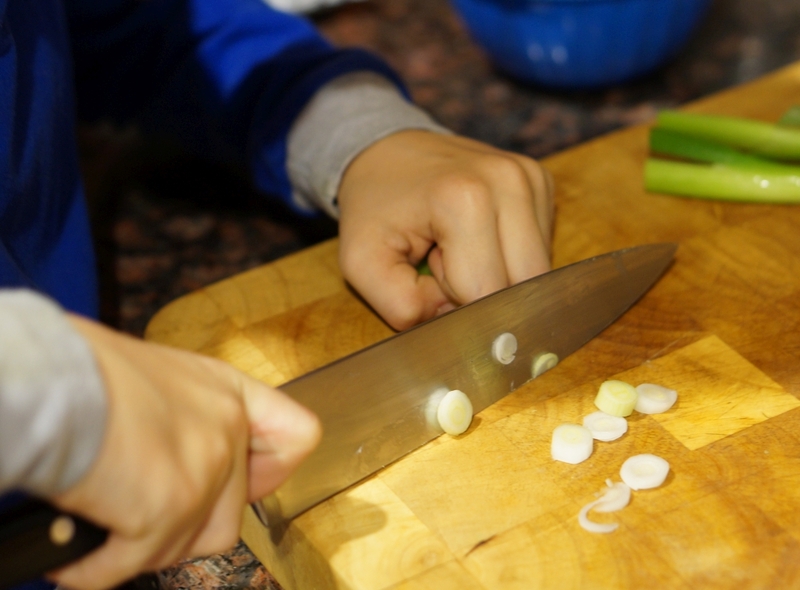 Now that kid is not only old enough to help in the kitchen but even to use a knife (albeit with lots of our supervision). Yikes! I thought he might enjoy this recipe and he certainly did. I dialed back the heat and kept it pretty mild but it still had a little kick from the ginger and he picked up on that. He still cleaned his plate though so we were happy. The recipe is really simple – mainly a tofu and broccoli stir fry with the addition of scallions and fresh ginger. The sauce is a mixture of hoisin sauce, soy sauce, water and a little chili paste. Delicious! We definitely shouldn’t wait almost 8 years before making this one again!